It's been two weeks since Jussie Smollett says he was attacked in a Chicago neighborhood and a lot has occurred thus far. Saturday, two law enforcement sources with knowledge of the investigation told CNN that Chicago Police believe Jussie Smollett paid two men to orchestrate the assault. They said that in the early morning of January 29 he was attacked by two people who were "yelling out racial and homophobic slurs" and "poured an unknown chemical substance on the victim" in the Streeterville neighborhood where he had been staying while filming his hit TV show "Empire." Almost immediately, colleagues and fans of Smollett expressed shock, sadness and love for him. Chicago Police spokesman Anthony Guglielmi told CNN that authorities had video of Smollett entering the Loews Chicago after the alleged attack with what appeared to be a noose around his neck. According to Guglielmi, Smollett told detectives that during his walk back from Subway sandwiches he was attacked by two men near the lower entrance of the Loews. Police were called 30 to 40 minutes after the attack, Guglielmi said. Investigators said they had the rope and Smollett's sweater in their custody and were testing for the unknown substance on them. Police told CNN they had not found photos or video of the incident. Guglielmi told CNN that a letter containing a white powder was received on January 22 at Cinespace Studios in Chicago, where "Empire" is filmed." "I had to be here tonight, y'all, I couldn't let those (expletives) ... win," he said. "Above all, I fought ... (expletive) back." 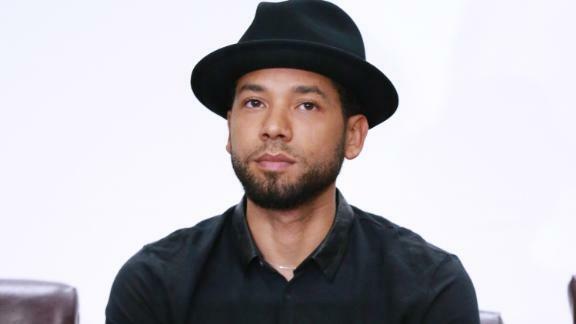 On Thursday, "Good Morning America" aired its interview with Smollett talking to Robin Roberts. Smollett told Roberts one of the attackers said, "'This MAGA country, n****r' and he punched me in the face so I punched his a** back." "It feels like if I had said it was a Muslim or a Mexican or someone black, I feel like the doubters would have supported me a lot much more," Smollett said. "And that says a lot about the place where we are as a country right now." One of the two men investigators questioned as persons of interest has appeared on Smollett's series, Guglielmi said Thursday. On Friday, police announced that the persons of interest had been arrested. Earlier Friday, said the brothers were being treated as "potential suspects" and that detectives had "probable cause that they may have been involved in an alleged crime." Police did not say what the men were accused of or what the alleged crime might have been. The men were released without charge "due to new evidence as a result of today's interrogations," Guglielmi said. "And detectives have additional investigative work to complete."